Is Commodore of the Royal Temple Yacht Club, and Rear-Commodore of the Royal York­shire Yacht Club. A noted and enthusiastic yachtsman, he has devoted much of his leisure time to the sport. He was born in 1852, and educated at Charterhouse and Balliol, where he gained his M.A. in 1880. He is head of the banking firm bearing his name, is a Fellow of the Royal Geographical Society, and was created a K.C.I.E. in 1892. 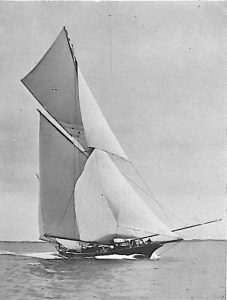 His first yacht was the Rose, after which he built to the design of Mr. A. E. Payne the 88-ton yawl Heartsease, and on both these boats he did considerable cruising. In 1899 he commissioned Mr. A. E. Payne to design the 52-footer Caprice, which he raced with some success. Glory, Yawl, 205 tons. Sir H. Seymour King. Sir Seymour is a popular flag officer, and has done much to further the interests of the sport both in connection with clubs and in legis­lative work in connection with the Yacht Racing Association. In 1901 he had built by Messrs. Camper and Nicholson the 205-ton yawl Glory, which was also designed by Mr. Payne. She has raced in a large number of handicap matches, and has proved to be a remarkably smart vessel, besides being one of the most comfortable cruisers afloat. Her Yacht Racing Association rating is 91.88. Clubs: Royal Yacht Squadron, Royal Temple, Royal Yorkshire. Residence: 25, Cornwall Gardens, South Kensington.